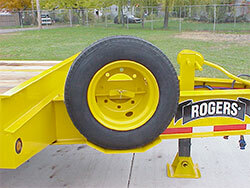 Motor grader ramps allow high ground-clearance, rubber-tired machines extra space to load over the gooseneck. 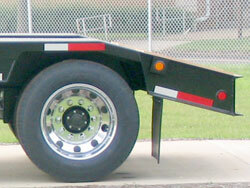 The low profile of the gooseneck makes access easier. 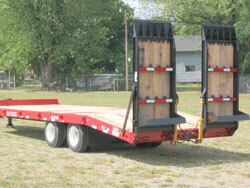 A 14° rear sloped extension, 36'' long, is available for fixed gooseneck trailers. 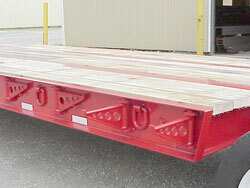 Hydraulic rear-loading ramps (39'' x 96'') are powered by the tractor PTO, and steel tie bars hold the ramps in place for travel. The control for both ramps is located on the roadside of the beavertail. 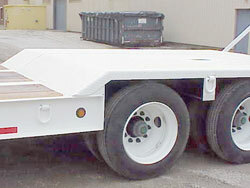 Additional options are: controls for individual ramps on each side of the trailer; and an electric/hydraulic pump to power the ramps. 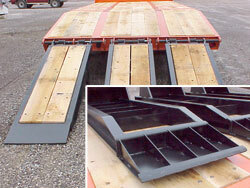 Ladder-style ramps (22'' x 72'') are available for 35-ton and greater. 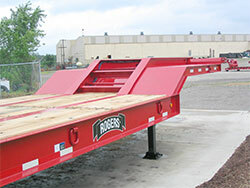 A shorter ramp (22'' x 62'') is available for 25-ton fixed gooseneck models. 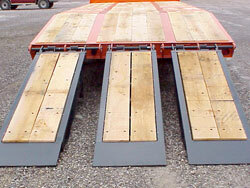 Wood-covered ramps (22'' x 72'') are available for 35-ton and greater. 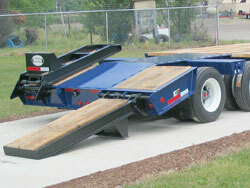 A shorter ramp (22'' x 62'') is available for 25-ton fixed gooseneck models. 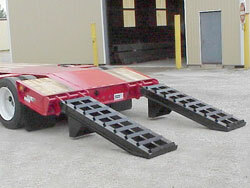 A manual third ramp in the center offers safer loading of narrow machines, like rollers. 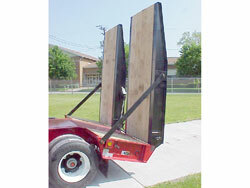 Shown with ramp wedge extensions. These brackets are permanently mounted and swing out to hold wood planks used to widen the deck an additional one foot on each side. Also available in a swinging removable style. 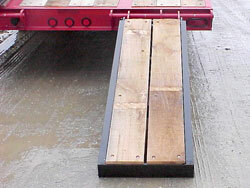 Stake pockets (4''x 4'') can be added along the side of the deck to hold posts in place. 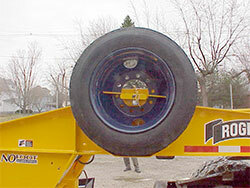 A tire carrier can be mounted to the curbside of the drawbar to hold a spare tire in place. Shown in optional RBC yellow. 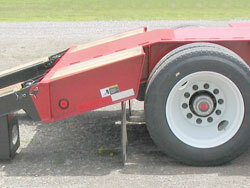 A mounted tire carrier can be installed on the curb side of the gooseneck. 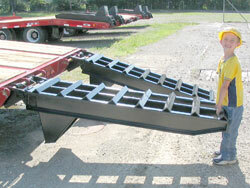 Not available with motor grader ramps, or on a full width gooseneck. 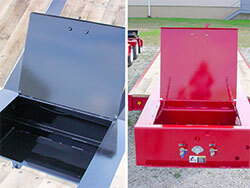 A steel-covered toolbox can carry chains, binders, and blocks, and it can be located in the gooseneck or the deck of the trailer. 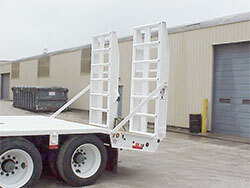 Gooseneck toolboxes are lockable. 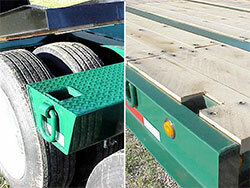 Deck toolboxes are lockable as an option. 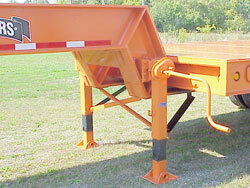 A heavy-duty 2-speed landing gear has a capacity of 50,000 lb. lifting and 140,000 lb. static. 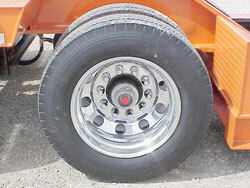 Flush wheel covers are made either of 1/4'' tread plate reinforced (shown here), or smooth plate with grouser bars on the incline. 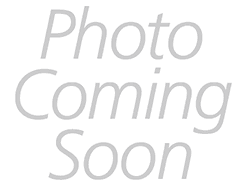 Raised wheel covers are installed 3'' above the main beam and are made either of 1/4'' tread plate reinforced, or smooth plate with grouser bars on the incline. Popular for their ''look,'' 10-hole, hub-piloted aluminum disc wheels are also durable and weigh less than standard steel disc wheels.